Gone in a (cosmological) flash: a team of astronomers found 72 very bright, but quick events in a recent survey and are still struggling to explain their origin. Miika Pursiainen, PhD researcher from the University of Southampton, presented the new results at the European Week of Astronomy and Space Science in Liverpool. Pursiainen and his collaborators found the transients in data from the Dark Energy Survey Supernova Programme (DES-SN). This is part of a global effort to understand dark energy, a component driving an acceleration in the expansion of the Universe. DES-SN uses a large camera on a 4-metre telescope in the Cerro Tololo Inter-American Observatory (CTIO) in the Chilean Andes. The survey looks for supernovae, the explosion of massive stars at the end of their lives. A supernova explosion can briefly be as bright as a whole galaxy, made up of hundreds of billions of stars. The researchers found the largest number of these quick events to date. 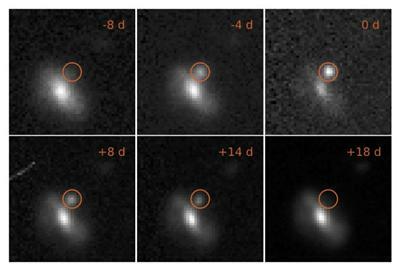 Even for transient phenomena, they are very peculiar: while they have a similar maximum brightness to different types of supernovae they are visible for less time, from a week to a month. In contrast supernovae last for several months or more. The events appear to be both hot, with temperatures from 10,000 to 30,000 degrees Celsius, and large ranging in size from several up to a hundred times the distance from Earth to Sun (the Earth is 150 million kilometres from the Sun). They also seem to be expanding and cooling as they evolve in time, as would be expected from an exploding event such as a supernova. Click here for more information on Physics and Astronomy at the University of Southampton.